The CEEE has been making a difference in K-12 economic and financial education for more than 40 years. By outfitting more than 1,000 teachers annually with high quality, grade-appropriate professional development and peer networking opportunities, UD’s Center for Economic Education & Entrepreneurship (CEEE) empowers educators to deliver the practical skills students need to succeed. The CEEE, affiliated with the Delaware Council on Economic Education, also offers a unique advanced degree program. Graduates of the Master of Arts in Economics & Entrepreneurship for Educators are well-positioned to become change agents in their own school districts, states and countries. What is the economic forecast for 2019? 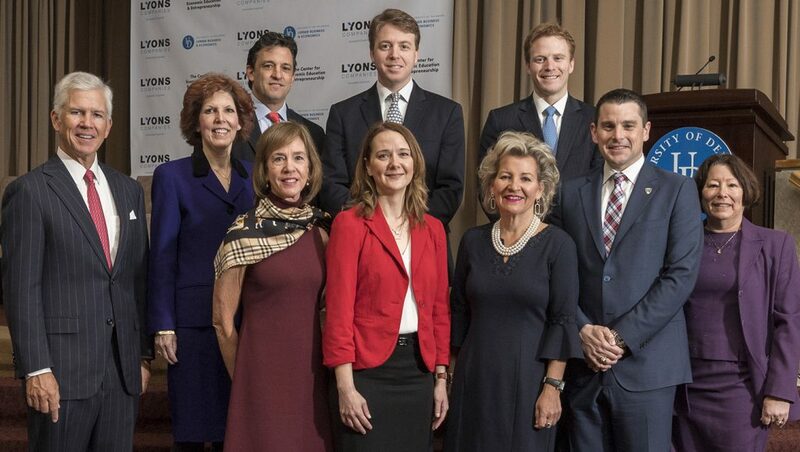 - Loretta Mester, Joan K. Woodward and Michael K. Farr shared their predictions at the CEEE and Lyons Companies sponsored 2019 Economic Forecast. UD wins big at National Economic Education Conference - Six honors were awarded at the National Association of Economic Educators Conference to both educators and curriculum connected to UD’s Center for Economic Education and Entrepreneurship. At the elementary level, representatives from community banks visit their local schools weekly to accept student deposits for non-custodial, no-fee savings accounts the students have set up. There are accompanying lessons that emphasize financial management and hands-on learning. At the high school level, banks operate branches within the schools. The branches are managed by bank representatives and staffed with student tellers. 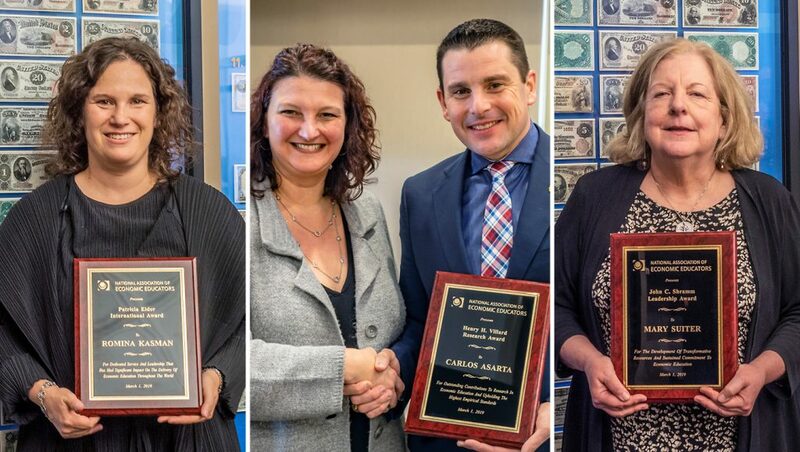 The annual Bonnie T. Meszaros Economics Teacher of the Year Award honors a Delaware K-12 teacher of economics, personal finance or entrepreneurship who has demonstrated a sustained history of commitment and contribution to economic education. Nominees must be a full-time Delaware K-12 classroom teacher who has been engaging students in economic education for five or more years. Evaluation criteria includes teaching, professional learning and economic program development. Self-nominations are accepted. The award winner will receive a $1,000 prize and will be honored publicly at the CEEE Annual Economic Education Conference. Bonnie T. Meszaros, the educator for whom the award is named, is a tireless proponent of economic education and has served as the associate director of the Alfred Lerner College of Business and Economics’ Center for Economic Education and Entrepreneurship for nearly 50 years. The CEEE Annual Economic Education Conference is designed for secondary teachers of economics. The day-long gathering includes a continental breakfast giving attendees the chance to meet and catch up with colleagues and to learn more about the graduate economic education programs offered at UD, concurrent sessions highlighting content and methods, a luncheon presentation from a respected keynote speaker and an awards presentation honoring the Bonnie T. Meszaros Economics Teacher of the Year. The conference is offered free of charge. Using existing children’s literature, Economics for Kids provides kindergarten through third grade teachers with a comprehensive kit of grade appropriate books, lessons, manipulatives and student exercises. The kits aid in teaching economics and personal finance lessons that can be integrated into core areas of English, language arts and math. Learn more. 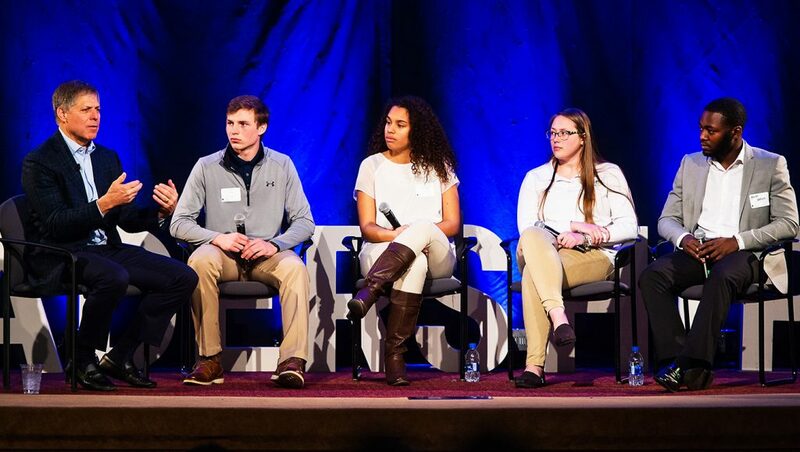 High school juniors and seniors are introduced to entrepreneurship and economic fundamentals through a 6-day residential experience in a college setting. Learn more. This CEEE-designed high school personal finance course is designed to encourage better decision making in personal finance and can be taught either as a semester-long or full-year class. Learn more. 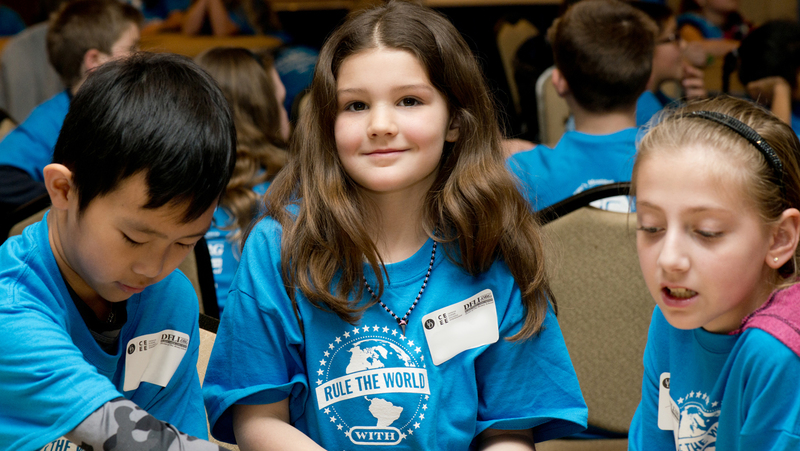 Teams of students in the third through fifth grades participate in a competition highlighting economics, entrepreneurship and personal finance. Activities include a written test, product creating, problem solving and preparation of a marketing strategy for presentation to a panel of judges. Teachers can begin preparing their students for the event using the online practice resources (PDF). Students in the third through sixth grades establish mini economic systems in which they create and manage currency and run businesses that provide goods and essential services for their society. Students experience roles as producers, consumers and voting citizens, and learn economic and entrepreneurial concepts. The PFC provides high school students with an opportunity to demonstrate their knowledge of personal finance by competing with other high school students from around the state and the country. The first round of the PFC is administered online in school. Each teacher’s highest scoring team is invited to participate in the state championship held in Newark, Delaware. Participating teams compete in a three-round competition, and the top two teams advance to a fast paced quiz bowl round. First and second place winners and their teachers are awarded individual cash prizes. This academic challenge is supplemented by the Keys to Financial Success personal finance curriculum authored by the CEEE and related teacher training. Teachers can also prepare students for the competition with access to a national question bank. Learn more. The Personal Finance Case Study Competition (PFCSC) provides Delaware Academy of Finance Pathway high school students with an opportunity to demonstrate their knowledge of personal finance in an academic challenge setting. Working in groups of three or four, students assume the role of financial planners. They are tasked with researching a hypothetical Family Financial Profile and preparing sound recommendations in the form of a written financial plan. A team of experts from the fields of personal finance and financial planning then evaluates submissions, inviting the highest scoring teams to campus to pitch their plans in person. All teams invited to present in person qualify for individual cash prizes. The Stock Market Game is a national program developed by the SIFMA Foundation and offered in Delaware exclusively by the CEEE. Teams of students invest a hypothetical $100,000 in online portfolios using a live trading simulation that develops research, mathematical, language, critical thinking and collaborative skills. Register at http://www.smgww.org. Banking professionals serve as visiting instructors to elementary classes throughout the state to present lessons on spending, saving and money management as part of a nationwide financial literacy effort to educate students on the importance of saving as the basis of future financial security. Gifts, grants and other support help the Center for Economic Education & Entrepreneurship to provide educational support to teachers and students and improve the future of economic education in the state of Delaware. Visit the University of Delaware’s giving page to make a gift in support of the CEEE. The CEEE is housed in Alfred Lerner Hall, located at the intersection of Amstel Avenue and Orchard Road. To prepare K-12 educators and students in economics, personal finance and entrepreneurship by providing dynamic, effective and standards-based professional learning, resources and programs. To see all students graduate as economically literate and productive citizens.